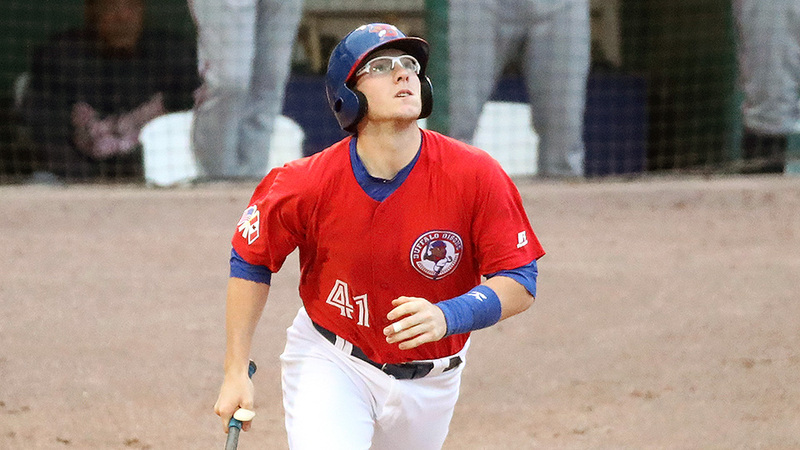 Danny Jansen had decided that 2017 would be different. He'd been limited to 53 games in 2015 due to a broken left hand and 57 games a year ago with a fractured hamate bone. Over those two seasons, he had hit .210 and .218, respectively. Desperate to recapture the swing that led the Blue Jays to select him in the 16th round of the 2013 Draft, Jansen tried out adjustment after adjustment. He studied film from his most successful runs, attempting to recycle the same mechanics. He tinkered with the placement of his hands. He got glasses to correct an astigmatism, allowing him to see the ball more clearly. In the end, Toronto's 17th-ranked prospect realized all he had to do was stop trying so hard. "Hitting has always been something that when I start thinking on it, it kind of goes bad," Jansen explained. "This year I came in and said I'm not going to think about mechanics. I'm going to be athletic, balanced and just be me and swing. See where that takes me. Not really thinking about my hands, but letting my hands do what they do." Jansen not only delivered the best offensive performance of his career, but he also produced numbers that ranked among the best of any catcher in the Minor Leagues. What's more, he did it while playing at three separate levels -- all after never hitting above .282 or appearing in more than 54 games in a season. Before the year even began, though, others in the organization noticed a more confident Jansen. "From Spring Training I noticed a different player," said Corey Hart, the hitting coach for the Class A Advanced Dunedin Blue Jays who has worked with Jansen for the past two seasons. "He did a tremendous job in the offseason and came back in a way better position to hit. ... You could see from the get-go that he was a different hitter." Things really started to pick up for Jansen once the real games began. Back in Dunedin for a second straight year, he exploded out of the gate with six hits in his first two contests and a .402 average through the season's first month. Once he got going, Jansen made it his mission to keep rolling. "I kept telling myself to just ride this wave," he said. "Ride the wave" became Jansen's motto as the season went on. He continued to place less emphasis on thinking about his mechanics and more on using his instincts at the plate. "I'd go into the cage with Corey and I would do my splits and I would just do something stupid with my bat and just hit it and have fun with it and not even worry about mechanics," he said. "If he wanted to tweak something with my lower half, then I would do it, but if it didn't work and I didn't like how it felt, then I would just go back to not thinking." After 11 more games the 22-year-old received his first in-season promotion, to Double-A New Hampshire, on Mother's Day. On the phone with his parents later that day, he excitedly told them the good news. A year after batting just .218 in the pitcher-friendly circuit, Jansen departed the Florida State League with a .369/.422/.541 slash line in 31 games. "It was deserved as much as any callup I've ever seen," Hart said. "It was very exciting to see." Jansen showed no signs of slowing against more advanced pitching in the Eastern League. He put together a .291/.378/.419 line with two home runs, 15 doubles, 22 walks and just 19 strikeouts in 52 games with the Fisher Cats. "I think it was all just confidence," Hart said. "Once you're not missing pitches you should hit and you're hitting them on the barrel, it instills confidence. That just snowballs and he just went with it. I think that gave him the mind-set that 'I can hit at this level and I can hit at the next level. I can just hit.'" Jansen admitted to being surprised when the call to Double-A came. When the Blue Jays informed him in August that he was headed to Triple-A Buffalo, it came as a downright shock. "Going up to Buffalo was even more surreal," he said. "I kind of blacked out. It was crazy. This whole year was just a whirlwind of blacking out, but I just kept riding the wave." Despite being on the younger side compared to many of his International League teammates, Jansen said he never felt overwhelmed by the move. Sharing a clubhouse with friends such as Michael Saunders and Gregorio Petit who had spent time in the big leagues, the product of Wisconsin's Appleton West High School quickly felt at home. Not surprisingly, more solid production followed. Jansen only spent 21 games with the Bisons but hit .328/.423/.552 with three long balls and 10 RBIs in that span. "Just wanted to keep my head down and work and make some good plays along the way," the 6-foot-2, 225-pound backstop said. When the season ended, Jansen had cracked the top 50 in all the Minor Leagues with a .323 average in a career-high 104 contests. He finished with 10 homers, two triples, 25 doubles, 48 RBIs and more walks (41) than strikeouts (40). Looking at the numbers months later, Jansen said he still finds them hard to believe. "I had an idea of what I did this year, but I still can't believe it," he said. "It happened all so fast. It was just promotions, promotions, promotions and success and I kind of got caught up with just riding the wave. "After having years of hitting .206 and .218 and all of a sudden doing this, it was just like, 'Wow, that was really something special.'"